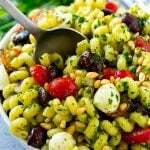 This pesto pasta salad is pasta with mozzarella cheese, olives, tomatoes and pine nuts, all tossed with fresh basil pesto. An easy side dish that’s perfect for a potluck or picnic. Pesto pasta salad is a must have for all of your summer gatherings. It’s fresh, flavorful, and the whole thing can be put together in 20 minutes. This pesto pasta salad is literally one of the best pasta salads I’ve ever had. That combination of fresh pesto, tender pasta, creamy mozzarella and juicy tomatoes just can’t be beat! This is definitely one of my go-to recipes for summer entertaining. HOW DO YOU MAKE PESTO PASTA SALAD? If you’re having a potluck or picnic, this pasta salad is a must-make. 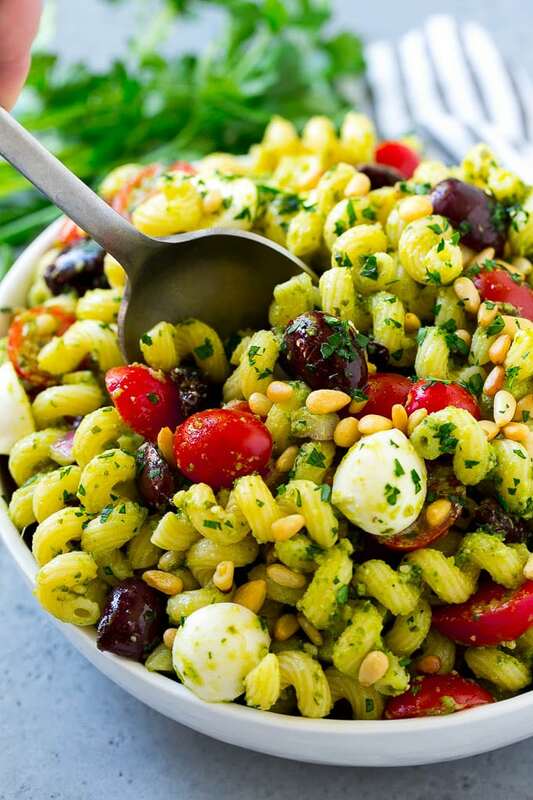 Al dente pasta is tossed with fresh mozzarella cheese, kalamata olives, tomatoes, and pine nuts, all tossed with a fresh basil pesto to create the perfect side dish. Your friends and family will be both impressed and satisfied with this delicious salad. For this pesto pasta salad, any short pasta will work. I used cavatappi pasta, but other great choices are penne or rotini. Go for the fresh pesto in the refrigerated section, it has much better and bolder flavor than the shelf stabled jarred pesto. Some of the brands I like are Kirkland (Costco), Rana and Three Bridges. Also, I’ve learned that pine nuts can get expensive quickly, so it’s best to buy just what you need from the bulk bins at the store instead a whole big bag. Pesto pasta salad can be made up to 6 hours before you plan on serving it. Like most foods, it’s best if served immediately but will still taste great if it needs to be served later on. If you feel like adding more veggies to your salad, some great additions are artichoke hearts, roasted peppers, or peas. You can also add a boost of protein by including grilled chicken, shrimp or cubed salami. WHAT IS CONSIDERED A SHORT PASTA? Pasta comes in all shapes and sizes. However, not just any pasta will work for every pasta recipe. Often times, you have to narrow it down to a specific category of pasta. For this recipe, we need short pasta which includes elbow macaroni, farfalle, fusilli, rotini, penne, rigatoni and any other shorter shapes. Pesto is a mixture of crushed basil, pine nuts, parmesan cheese, garlic, and olive oil. It’s got a strong, bold flavor that works as a great addition to many recipes. Pesto is typically used in Italian dishes such as pasta, pizza or on bruschetta. I love that this pesto pasta salad is full of tons of great flavors and textures, yet is easy enough to be whipped up at a moment’s notice. My kids love it too, I just omit the red onion when I’m serving this dish to the little ones. The fact that it can be a side or a full meal is a plus for this mama’s busy schedule and I’m sure it will be for yours as well! 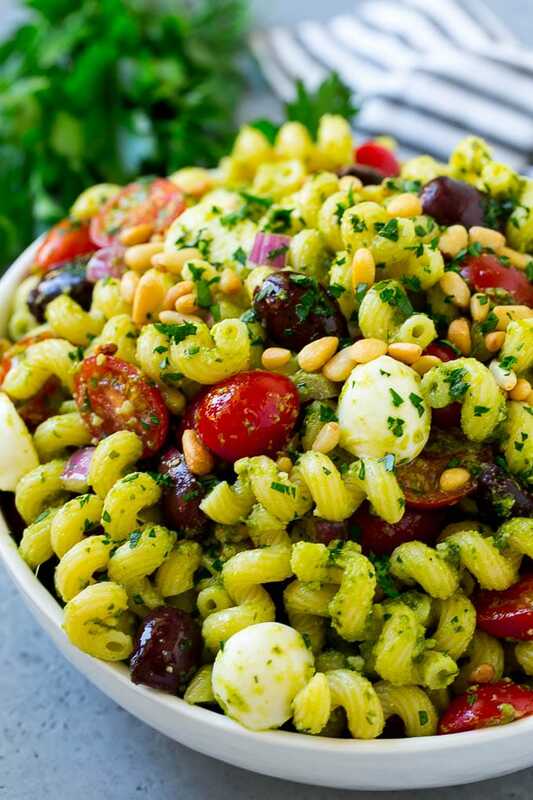 This pesto pasta salad is pasta with mozzarella cheese, olives, tomatoes and pine nuts, all tossed with fresh basil pesto. An easy side dish that's perfect for a potluck or picnic. Drain the pasta and run cold water over the pasta to cool it down. 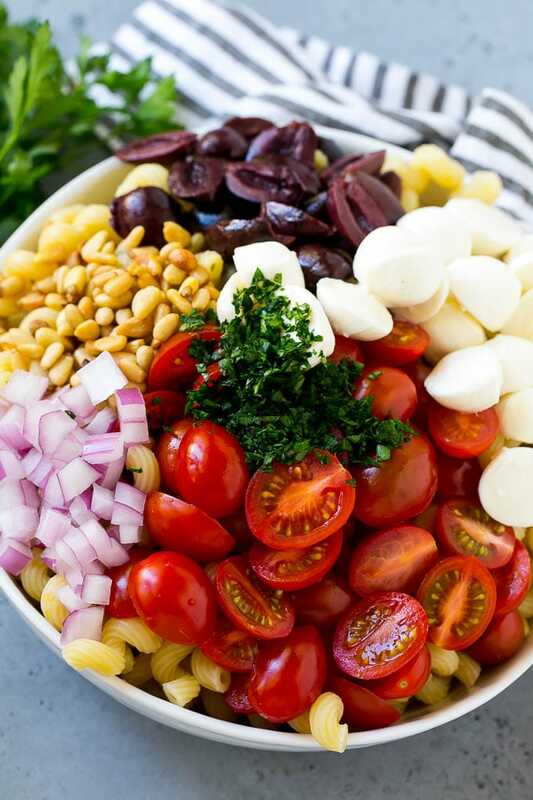 Place the pasta in a large bowl along with the cherry tomatoes, mozzarella balls, olives, pine nuts, red onion and parsley. Pour the pesto over the top and toss to coat evenly. Serve, topped with additional pine nuts and parsley for garnish. Pasta salad can be prepared up to 6 hours in advance and stored in the refrigerator until ready to serve. I would make this a main course! I love all pesto pastas! We will b putting together a dinner for the teachers in my sons school and I believe this would make a wonderful addition and something no, one else would make. This looks so tasty! My husband would love this, I’ll have to surprise him with it one day, thanks for sharing the recipe. Wow this looks so good. I am loving the colours. Haven’t had a salad like this before would love to try it out for the fam! This salad has everything I love most: mozzarella, tomatoes, pasta, pesto. I totally need to recreate your recipe at my party this weekend. I bet everyone will love it. 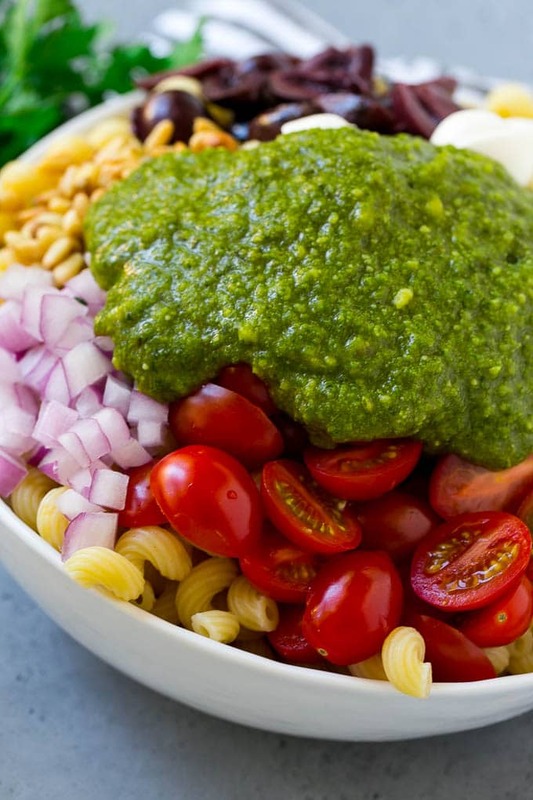 The Pesto Pasta Salad looks really so refreshing. A perfect recipe for the summer months.. A great blend of taste and health too. I love pesto pasta but for some reason my family aren’t so crazy about it. This looks absolutely delicious! I have been seeing so much pesto everywhere lately that I am craving it… immediately! 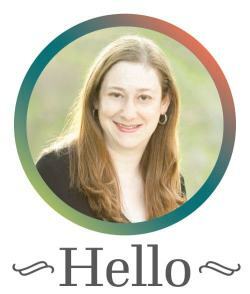 I would love to try your Pesto Pasta Salad out so I’ll definitely have to give it a try. Oh my gosh, I love pesto and I love salad so this seems like a win win. I want to try this! It looks and sounds delish! 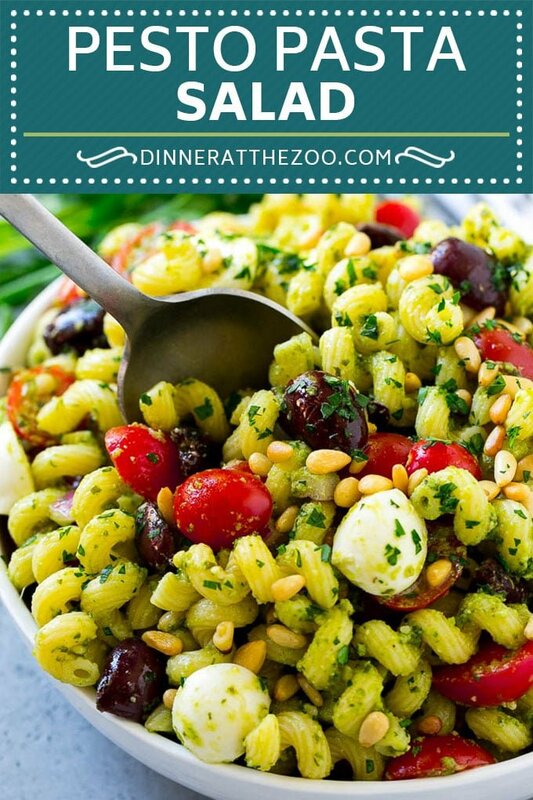 I love a good pasta salad and this one both sounds and looks amazing! Great post! With it being so hot I need a fun, easy meal that the kids will eat. Thank you! I love pesto, it’s one of my favorite sauces and I love the fact that it goes so well with pretty much any recipe! This pasta salad’s perfect for parties during the summer. I think people will really enjoy it. I love the flavors as well. I’m keeping the recipe! I bet this tastes amazing. I could totally make a great GF/DF version of this and my family would enjoy. I need this in my life! This is the perfect pasta salad! I need to make this the next time we grill out. Yum. I would love to serve this to my family and take it to a party. It’s colorful and I know it is flavorful! This sounds so good. I am super excited to make this for the cookout I am hosting this weekend. I think everyone will love it. What a great mix of flavors. I have never thought about putting pesto in a pasta salad but boy does that is got to taste delicious! I am totally going to try this. 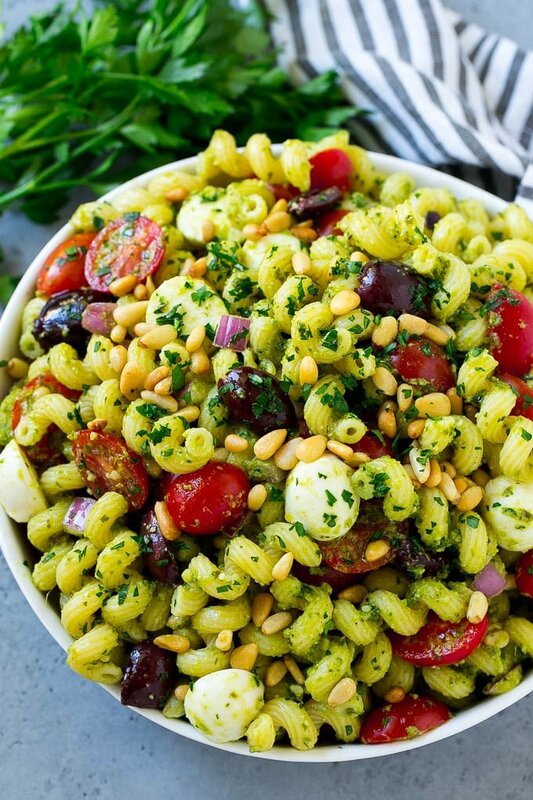 I absolutely love pesto pasta salad and can’t wait to try your version. It looks so colorful and tasty. Pine nuts always add texture and a nice crunch. It looks so delicious.